Detox products: 5 Panel Multi Drug Urine Test Kit (THC/COC/MET/OPI. Pass drug tests, passing all drug test. 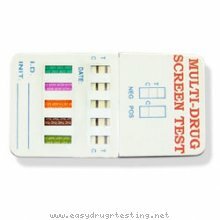 The Multi Drug 5-Panel Drug Test Kit Urine is perhaps one of the best at home multi-drug test kit, whether you are testing yourself or somebody you are concerned about. It is very easy to use and extremely accurate and quick multi drug test kit. That 5-Panel Drug test kit cover most common illegal drugs as: THC (marijuana), Cocaine (Crack), Methamphetamine (Ecstasy), Amphetamine, Opiates (Morphine) and PCP (Angel Dust).